A company focusing on water treatment technology. We have our own research and development department and hold a number of international patents. 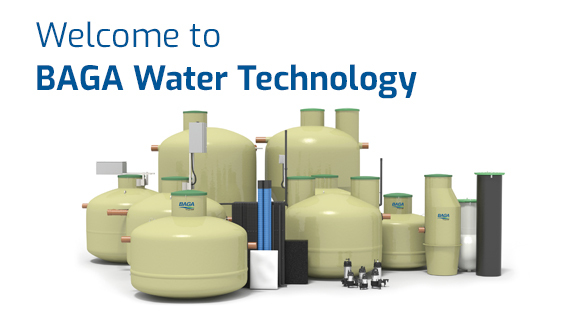 This reflects on the BAGA products keeping us at the leading edge in water technology. We offer complete solutions, all the way from project to fully developed products including service agreements. BAGA offer septic tanks, waste water plants (1 – 500) households, water plants, pumps, pumpstations, grease separators, oil separators, closed tanks and chemical tanks. The company is based in Karlskrona, Sweden with sales offices in Stockholm, Göteborg, Norrköping, Växjö, Umeå, Alingsås, Örebro, Stenungsund, Uddevalla and Västerås. To view BAGA’s complete range of sewage products, please visit: http://baga.se/avlopp/produkter. We grow 10-20% organically every year on the Swedish market only thanks to outstanding technology and customer support. We plan to accelerate our growth further by exporting the technology to key markets overseas. We have recently started a new division for potable water to become a single source supplier for all water demands.